There was some sewing this past week, not a lot, but some is better than none. So I have a small amount of stash out. I did the brown nine patches for the guild swap for the month of April, and I discovered that I hadn't cut the green triangles for the mystery quilt, which I why I couldn't find them when I wanted them a couple of weeks ago. So I can count those out. And once I started sewing the triangles together, I discovered that I hadn't cut enough of the background triangles, so I had to cut more of those, which can also count as stash out. Balance: 96.1 yards more in than out. and actually finished it, and its backing as well. But, I don't have pictures of the finished product, because it's at the other house, which seems to be the story of my life lately. LOL! Maybe we'll stop be the other place and pick it up either on my way to work, or on the way home. That way I can have pictures for design wall Monday. 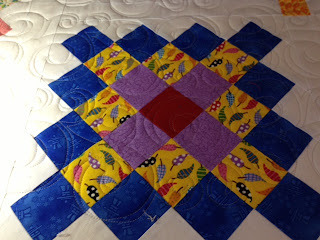 I'm linking up to Judy's Patchwork Times Stash Report . I've been seeing a lot of talk lately about google reader disactivating soon, and the recommendations to join bloglovin. So, I've done that and am also "claiming" my blog over there. I'm not sure exactly what that means, but I would hate to see my blog suddenly vanish. So I'll follow instructions and paste the code required here. We are slowly, but surely getting moved and settled in. We are at the point now that we are spending more time at the apartment than at the old house. I think I like being able to do the moving process slowly, rather than all at once. It sure does cut into my sewing and my facebook chat time with friends, though. ( Miss you, Susan). I've been spending a lot of the past week getting caught up on customer quilts, and they are done!! Woohoo!! I still have a waiting list of people wanting to bring me quilts, which is lovely, But they will be done in my new room, once the machine is moved and set up. I finally have pictures of that room. This first picture is looking towards the front of the room That wall at the front is going to be my design wall. The door on the left is the entrance from the outside. The door on the right goes into the rest of the garage. Those bulkheads from the ceiling are where the garage door opener rails and motor are. They are going to be perfect for some wall hangings to display. This next picture is looking towards the back of the room. I am planning on having some hanging racks on that wall, made from 2x4's and coat hanger hooks that I can put dowels across to hold quilts while they are waiting to be done. The long arm machine will be along the wall on the left, and I am hoping for enough space left to put a length of table top, with shelves underneath it along the wall to the right. But I won't know that until the machine actually is in that room and set up. The only thing left to do in there is to get baseboards and quarter round along the edge of the floor and the walls, and to get my design wall built. And cleaning it up, of course. My sewing area in the apartment is set up, but needs some organizing yet. But since that will be a never ending thing, I'm not too concerned about that. And I have to wait until the rest of the furniture arrives before I can make final decisions on where things are going to go. The couch is going to be where the 2 chairs currently are, so a lot of the mess won't be visible from the living area. Here's our kitchen, looking all cozy and welcoming. It has a new Kuerig coffee maker in it, thanks to Lisa and Brian, which is being enjoyed immensely! We spent a lot of time yesterday, Scott and I, deciding on where everything was going to live in the various cupboards, so that chore is done, and we're pretty much functional now. And This is Scott's end of the room. He's an abstract artist, and is looking forward to being able to set up his painting supplies and actually doing some canvases behind those screens. 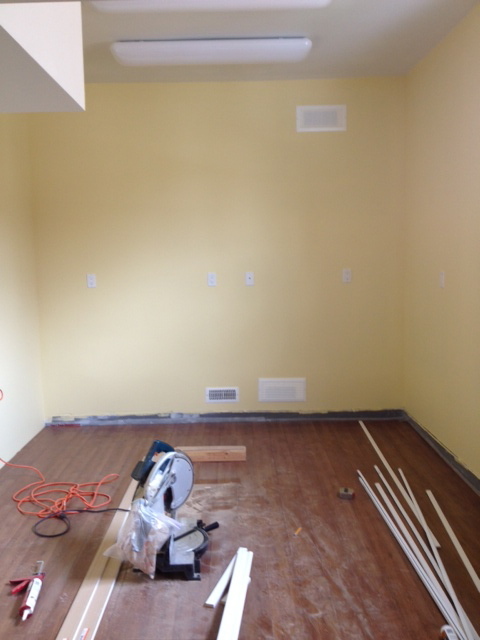 There is going to be a futon on that back wall, so the area can also double as a guest room. The TV is only on that shelf temporarily. It will eventually get set into its living space above the fireplace. WE are planning on Wednesday as the take apart the long arm machine day, which I must confess has me rather nervous. She is, after all a delicate, if rather large baby. LOL!! Final moving day is a week today, and we are done, other than the final closing details with the lawyer. It feels like this has been going on forever, and I am so glad that it is so close to being done. I love our little space. There are, of course, some areas that will take some getting adjusted to..... the bedroom being so close to the TV being the most obvious, so far. But we'll get it worked out. Back at the end of February, I made myself a list of 4 things I wanted to get done in the month of March. 4. Sew something, anything, maybe pick something from my Newfo list on my side bar........ done, and finished, although it is over at the other house, so I don't have pictures of it finished. Maybe by Monday?? Goals for April. These are all going to be quilty, and separate from moving issues, and will include working on finishing a long standing UFO. 2. Catch up on Grandmother's Choice. I haven't done any of these in the past month. There, that feels better. Quilt related stuff on my to-do list, at last. When Judy posts her link box for her Getting it Done Challenge, I'll be linking to that. I spent all day yesterday sewing. Did it ever feel good. Gail hosted another sew day. So Christine and Carol and myself spent the day sewing with Gail. I finished up my one set of half square triangles for the Bonnie Hunter mystery in the Quiltmaker magazine. I still have the smaller ones to go. Seems that I forgot to take the dark sides of the smaller ones, or maybe I haven't even cut them yet. I'm going to have to search around and see if I can find them. Then I finished that baby quilt I was working on, and then moved on to doing the black nine patches for the guild swap. After I got home, Scott came and picked me up and we went back to the new apartment, where I spent the evening also sewing. I put together the backing for that baby quilt I finished. So I have usage numbers this week, and fairly decent ones. I'm hoping this is the start of a trend. Balance: 97.3 yards more in than out. So I'm back under 100. I'm planning on doing more sewing today, so that should help. 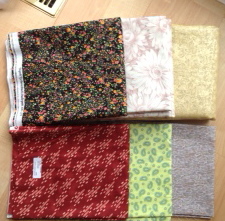 I have found some fabric in my stash that will make perfect curtains for the bathroom and shower curtain as well. SO I might do those up today. I also have to make a trip to the local fabricland, while their sale lasts, and see if I can find some fabric I like for living room curtains. Making curtains is not real close to the top of my list of things I like to do, but I hate paying the price for ready made ones, so make them I will, if I can find what I'm looking for. 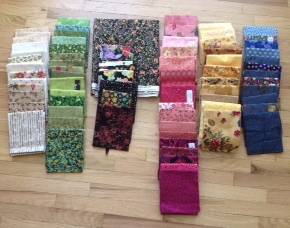 I'm linking up with Judy's stash report at Patchwork Times. I think I am in trouble. I think I'm hooked. I finished my first pair of socks, and have started another. It is also Kroy sock yarn, but striping this time. 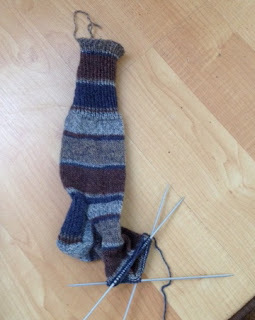 It should be interesting when I start the second sock, since I didn't make a note of where the colours were when I started the first one, so I could end up with 2 totally differently striped socks. I was reading the other entries at Judy's Patchwork Times and Carol was talking about some yarn that she ordered that was on sale, and gave the link to the store. Just out of curiosity, I went and checked it out. You know what happened next, don't you? Yep, there is yarn coming to my house. 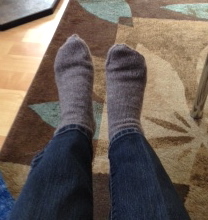 The thing is, there is no comparison between the way these socks feel, and store bought ones. So, like I said, I'm hooked on knitting socks. I have a few different yarns coming, including one that will maybe pool instead of stripe. Judy has a challenge going about getting sock colours to pool rather than to stripe, and I just might join in. I've never actually met Judy, but she is really having an influence on me, and getting me to do all kinds of things I've never done before. Have I mentioned lately that I love blogging, and the people I've met through it? 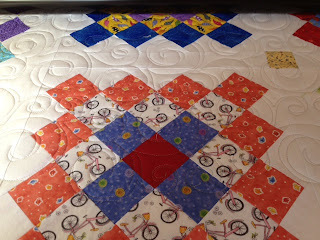 Every now and then I get a quilt in that is just so much fun that it makes me smile the whole time I'm quilting it. The one I am doing now is one of them. It's a Great Granny Square that belongs to Gail. 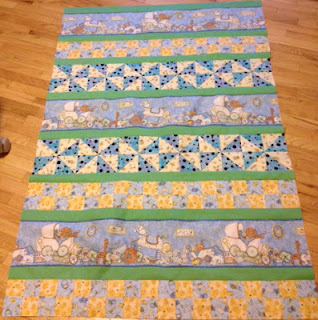 The fabrics she used in this quilt are just so much fun! I love the bikes in this fabric. The flowers here make me think that maybe there is hope for spring and summer coming. It is snowing outside as I type this. The chili peppers here are just a blast! 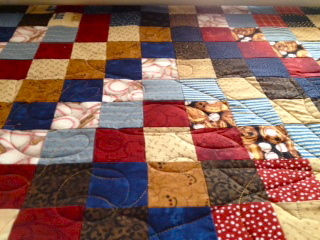 I'm having fun quilting this one, and it is about halfway done. I had to sit to rest my legs for a few minutes, and thought I would share this. Well, now is the time I have to add in the added numbers again. I must confess to being a little nervous about seeing the final total added number. Can I procrastinate it? Maybe a little bit. I can tell all about my Skype visit with Avery. For the past 5 or 6 weeks, Avery and I have been visiting via Skype. With each visit, I'm able to understand more of what he says. He has a large vocabulary, it's just understanding what he is saying that is sometimes difficult. But also, with each visit, he is becoming more engaged with talking to me through the computer. It has been wonderful, being able to see him and talk to him this way. Winter travel is so difficult in our stretch of the woods, especially up near the lakes where they live, the snow squalls can come in with very little warning. But, I have some vacation booked in May, and I'm hoping we can spend part of it visiting with them. Have I mentioned lately that I love technology and computers? Yesterday was International Quilters' Day. It would have been a lovely day for sewing, but I didn't sew a stitch. I spent most of the morning on the computer researching for the possible purchase sometime this year of an upgraded trailer. Still nothing huge or fancy, more of an upgrade from our old hard top that requires quite a lot of time and effort for set up and take down. We'd like to upgrade to what is called an expandable, or other places call them hybrids. The beds fold down from the front and back of the trailer, so they don't take up precious floor space within the trailer. So the bed areas look like a soft trailer, but the rest of it is like a regular hard sided trailer. It has 2 big bonuses, for us when we will be travelling. We can access the kitchen area for having our own meals, rather than having to stop at restaurants. And. at our age, an even bigger bonus of a bathroom that travels with us. LOL!! My long arm room at the other house is coming along really well. The drywall is all up and sanded, and my wonderful husband finished painting it yesterday. It looks wonderful. But of course, I was too distracted to remember to get a picture of it. The electricians are supposed to be coming tomorrow to put in the lights, and then all that is left to do in there is install the laminate floor. Our plans at the moment are to move the weekend of April 6th. 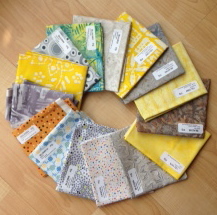 I can then begin brand new in a brand new studio for machine quilting. Shall we all give a huge WOOHOO? I know I am. Hmmmmm?? What was that? Stash report..... confess up time??? Oh right...... see I did manage to procrastinate that. Balance: 101 more yards added than used. YIKES!! That's worse than I thought! I'm definitely going on a fabric diet. That's it, no more button pushing until I can say at least 50 yards used. I wonder if I can stick to that?? 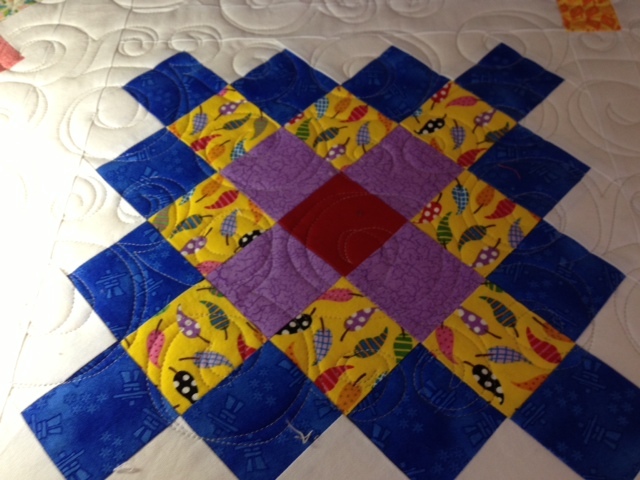 I'm linking up to Judy's Patchwork Times weekly stash reports. I have to work this afternoon, so there will be no sewing for me today, either. And this week, I really have to concentrate on finishing up some customer quilts, so there won't be any sewing this week, either. And sometime, I really do have to do something about starting to pack up for moving on the 6th. After that...... 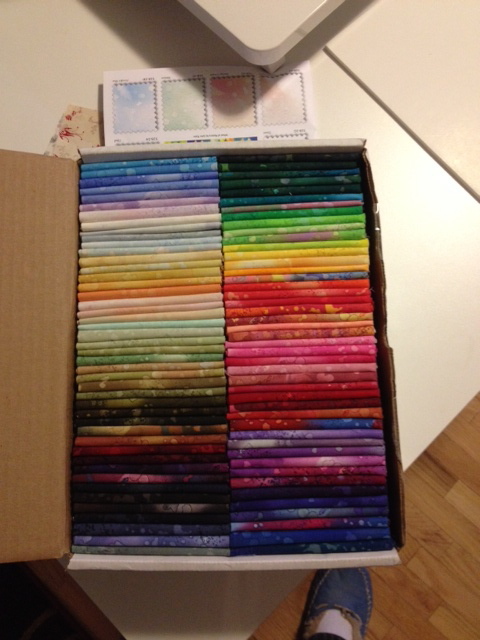 I'm going to reward myself with some quality sewing time, and maybe even some big time stash reduction. Judy, over at Patchwork Times, is always full of good ideas for things to write about on our blogs. Today she suggested that we write about things that have happened in the past week for which we are thankful and grateful. I have a HUGE list of those things right now. Our house went on the market on Saturday. We received an offer for the house yesterday, and it was a good one, which we have accepted. The deal closes on April 12th. I am doing such a HUGE happy dance over this. It has been such a long and patience and faith trying process, at times. But the Lord has been so very gracious and good to us. He helped me, during those 4 days of showings and waiting, to keep focused on Him, and to wait patiently for Him to work His will. I have a hymn that I love, "One Day At a Time", and I was singing it to myself pretty much the whole 4 days, except I changed the word "Day" to "step", asking the Lord to keep me focused just one step at a time, to light our path one step at a time, and guide us where He wished us to go. He graciously answered that prayer, and more. I am thankful that my long arm room is progressing well over at the new place, and should be ready for moving in three weeks from now. I am thankful that the showings of this house are done, and we can get back to living and working in it, for the time we have left in it. I am thankful for a loving daughter and son-in-law who are taking us into their home, with the intent of helping us as we grow older and perhaps frailer, although I hope the frailer part is a long time from now. I am thankful that our finances, after we move, will allow me to retire in September, at which time I can become a lady of leisure. LOL!! A lady of leisure who can spend her days doing quilts. I am Linking up to Judy's Good News Thursday where there are also other people sharing about the good news in their lives. It seems we see so much bad news on the TV news shows, or in the newspapers or internet news sites. It is so refreshing to read about good things instead. We just might be able to say "SOLD"
After a very intense 4 days, with 13 showings of the house in those 4 days, we just might be able to put a sold sign on the lawn. We have 7 days to wait while the insurance company that insures Canadian mortgages looks at the paper work. This is usually a formality, but it won't be official until those final papers are in our hands.We have heaved huge sighs of relief that it is most likely all finished and we can go back to living in our house and using our house for the month that we have left in it. In the meantime, I have been keeping my hands and my brains occupied with some easy sewing. I've had this infant border print in my stash for the last 2 1/2 years, and was never quite sure what to do with it. I played around in EQ7 and came up with a fairly easy, but effective, design, using some of the fabrics that I have bought in the last couple of months..
We don't have any babies, that we know of, arriving in the family in the near future. But it never hurts to a have a baby quilt on hand, just in case. It has one more row of four patches to go on the top. Then it will be surrounded by a 1.5 inch border of the green, and then each side is going to get some flying geese, with the goose being a dark blue and the sky being the same yellow as in the four patches. A fast and easy reduction in the stash that has been building up here. My last order of fabric came in the mail yesterday. I did some sewing this past week!! I have something to show!! It doesn't take much to get me excited, does it? A little fabric, a little sewing time, and I'm perfectly content. I worked on the Lazy Sunday Mystery by Bonnie Hunter yesterday. All of the cutting is done for step one. And all of the four patches are made. I've been playing around in EQ7 with some ideas for using up some of the children's themed border prints I have here, so I'm thinking of doing something with some of that today. And maybe some sewing on the triangles for the mystery. We are at the apartment for the afternoon, to allow for more showings of the house, so the afternoon is mine to sew what I wish, and it feels wonderful! I'm linking up to Judy's Patchwork Times where there is lots of inspirational stuff to see. Since the afternoon is mine, I just might spend some time over there looking. First the good news. The house is up and listed on the market. There will have been 8 showings between yesterday and the end of today. It is amazing what the real estate photos can do for a place. They make our tiny little house look like it has huge rooms. 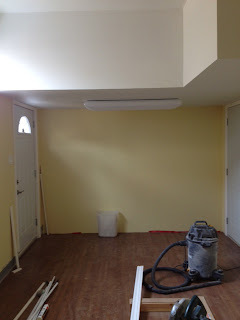 If you are interested in checking it out, the link to the listing is here And the other piece of good news is that the dry wall is now all up in my long arm room, and the guys are coming in tomorrow to start the taping and mudding of the dry wall. Shall we all give it a big WOOHOO!!!! Finally, I did some sewing in the past week. I did up the pink nine patches for the swap at the guild. And I also did some cutting for the Lazy Sunday Mystery that Bonnie Hunter has in the current Quiltmaker magazine, so I can count that as out, as well as the nine patches. I also finished emptying one of the boxes of new fabrics that was delivered quite some time ago, so there are some more added numbers. The set up of my sewing area is starting to take shape. I have several more shelving units now, and a dresser to use as the base for my cutting table. This is what it looked like last night, while Matt was working on putting it all together. And this is what it looks like now. Matt is in the process of building me my sewing table, which is what that big piece of melamine if for. It looks like a have a mini fabric store down here. LOL! I'm currently sitting in that comfy looking recliner, right by the window. It's wonderful!! And now, on to the stash report. Balance: 81.35 more yards in than out. YIKES!! No wonder it looks like a mini fabric store down here!! Ah well, now that I'm almost set up, I can put the pedal to the metal, as the saying goes, and get cutting and sewing again. Shall we all give another huge WOOHOO!! I know I am. LOL!! I'm linking up to Judy's Patchwork Times and then I'm going to go and sew!! 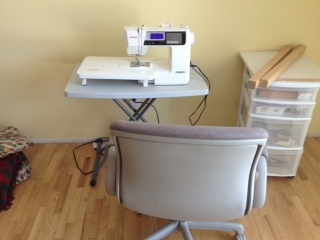 I went over to the new apartment this afternoon, since I had decided that it was time to set up a sewing space. Any space, I don't care how big, or how permanent, at this point. Just as long as it is something that will work. I found a small folding table, that also adjusts in height. The bonus was that we already had it, so I didn't need to go out and buy anything new. I set up my machine, and now I'm good to go. It isn't big. It isn't glamorous. But it will work. I was going to stay over there this evening and do some sewing, but my eyes aren't great for driving in the dark..... the lights get all kinds of weird halos and shadows around them...... so I thought I'd better come home since it was starting to get dark. One of the things I did while over there was rummage around in all my fabrics and find some possibilities for doing the Lazy Sunday Mystery quilt, designed by Bonnie Hunter. Clue number one is in this edition of Quiltmaker magazine. I think the ones shown below here just might be them. I started with that large piece of black backgound print, and then pulled colours from there. Gail and Christine are doing this one too, so there will be the opportunity, now and then, to be able to have some sewing get togethers, which will be fun. I also have some pink nine patches that I have to make before March 14th for the nine patch swap at the guild. Sounds like I'm turning into quite the social butterfly, and having a blast doing it. Another Monday, another non-existant design wall. But, we have just received the fabulous news that the city has finally issued the permit we need to go ahead with my long arm room! WOOHOO!!!! I do have something I can show, though. Gail brought me a quilt the other day, so I can give a sneak peak. It's baseball themed, and so much fun. She found a pantograph called Batter Up on the Digitech Designs web site that I then purchased and drew out. I must say that I love that web site. I love being able to refer my customers to it, get an idea of what they are looking for, and then purchase the design. I can then draw the design out to the size that is appropriate, and have an addition to my pantograph library that I might not otherwise have picked. I'm linking up to Judy's Patchwork Times, and then I'm off to do a couple more passes on this quilt before going in to work this afternoon. Remember last week that I said I hit the checkout button for the sale at Thousands of Bolts? The one where their fabrics were on sale for $3.95 a yard? 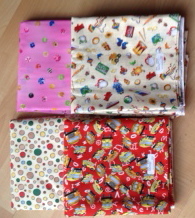 Well, those fabrics arrived this week. I wasn't going to count them as in, just yet. I was going to count them as in when I got them over to the new apartment, and, as I got them onto their mini-bolts, then I'd count them. But, I was reminded by Gail that, if I'd opened the boxes and taken the fabrics out, and looked at them and petted them, then they counted as "in". So, I admitted that she was correct, and will have to confess up, and add in those rather large numbers. I may as well show pictures, so you can see why I simply couldn't resist. I am planning, in my head at this point, a quilt in greys and aquas and reds and blacks, So I added these to that collection of colours. I am also planning, still only in my head, on doing a large number of kids quilts. 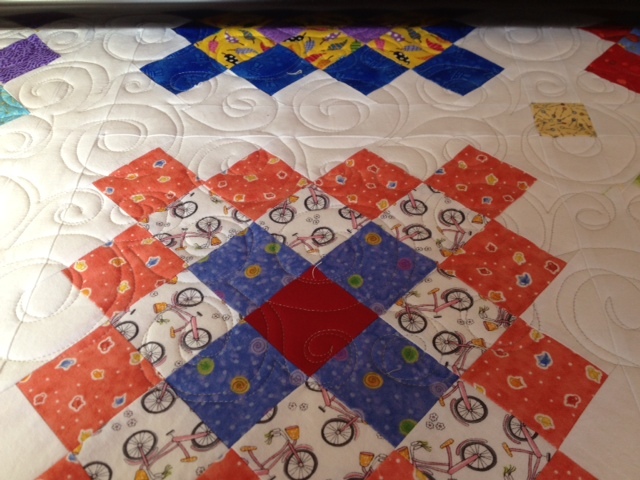 So I simply had to add in some backings for those quilts. And then, since I'm always on the look out for diagonally printed stripes that make for wonderful bindings, I found these, which I don't have. So, of course, they came home, too. And then, I found some gold fabric that would make a lovely backing. And then there was the beige floral that would also make a lovely backing, or background for something. So they went in the cart. And then, when I hit the checkout button, they told me that I could fit a few more yards in to the packages for the same shipping price, so the rest of these went in, just because I liked them. Added this year: 66 yards. Balance: 44.1 more yards in than out. 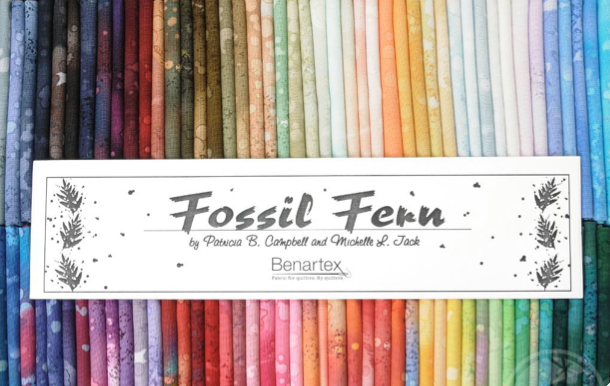 And, to top this all off, Craftsy was having a sale on Bernartex Fossil Ferns, all the colours in fat quarters in a box of 100, with free shipping, even here to Canada. Those colours are all so gorgeous, that I simply couldn't resist. It worked out to $1.84 per fat quarter. So those will get added when they get here as well. Do you think I might need an intervention?? Am I becoming a fabric hoarder???? Nah, I don't think so. I'm hoping we will be making that trip to Ikea on Saturday,which means I'll be able to get my sewing area all set up and start to make a dent in those added numbers by actually using the fabrics and making more quilts. We are hoping to also get together for a visit with Lisa and her family that same day. We've been trying to get together with them ever since the end of December, but her kids have had an awful winter with sickness. They keep passing bugs around to each other that they pick up at school. They just get over one thing, when they get another. Poor Lisa and Brian are exhausted. On the moving situation, our TV and Internet service here at our house are done as of the 22nd of this month, so I'm thinking I'll be mostly over there by then, coming back here to use the long arm. Oh, I like the sound of that..... March 1st. Spring can't be very far away now. I haven't participated in this linky party before. 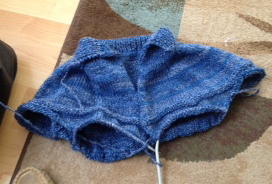 But I've been doing a fair amount of knitting lately, as opposed to sewing, so I thought I'd post about my progress. First off, these came off the needles last night, and onto my feet this morning. I did these with Kroy sock yarn, since I didn't want to start off with really expensive yarn. I was quite dubious when I started these. Both because I'd never done socks before, and because I wasn't quite convinced about how comfortable they'd be, even though I've been reading other people raving about their hand knit socks for quite some time now. I have to say, I just might be a convert. They are warm, and they are comfy. I can see me doing more of these. The other thing I've been working on is a top down bulky knit zipper up the front sweater. This one is really fast knitting, due to the fact that it is really bulky wool. But it is soooooo soft. I have another, really comfy bulky sweater that I have been wearing for over 32 years. I don't necessarily want to retire it, but I really should have a new one. LOL! 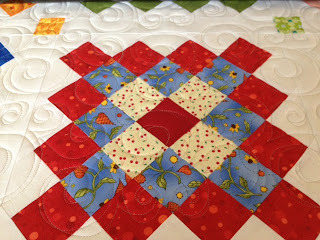 I'm going to link up with Judy's Patchwork Times (I seem to be doing that a lot lately. She's got a lot of fun link up ideas. ), and then I'm going to go finish drawing out a new pantograph I just bought.